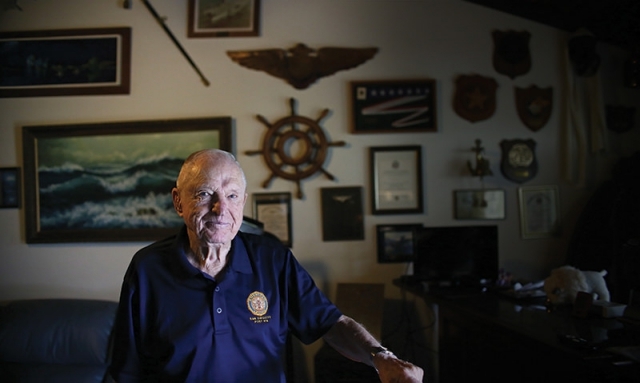 During his 37-year career in the military, Royce Williams received a number of awards, including the Silver Star, and was praised for his leadership and piloting skills. He planned and led a successful aerial strike against the North Vietnamese, fiercely fought for proper repatriations of POW/MIAs and helped train a generation of Navy pilots. But for all his accolades and the lives he touched, what stands out most in his august career are 35 minutes that Williams was forbidden to reveal to anyone – even his wife – for 50 years. Williams grew up near the South Dakota-Minnesota border, spending his days fishing, playing hockey and getting into mischief. “I was a lively kid, got in my share of trouble,” he recalls. He wanted to follow in the footsteps of his father, a machine gunner in World War I. College wasn’t in the cards, so Williams worked hard to achieve the rank of Eagle Scout – the first in his community – as a way to qualify for the Naval Academy so he could eventually become a naval aviator. The Japanese attack on Pearl Harbor interrupted their courtship. Williams, 16, answered the call to service by joining the Minnesota State Guard. As soon as he turned 17, he signed up for the naval aviation program and started his career after graduation. Williams stayed stateside, starting his Navy career in 1943 at boot camp in Corpus Christi, Texas, and winning his wings of gold in Pensacola, Fla., in 1945. His service continued through the Korean and Vietnam wars, in which he flew no fewer than 220 combat missions. During the Korean War, Williams served as a pilot for an F9F-5 Panther on board USS Oriskany. Everything changed the morning of Nov. 18, 1952. For Lt. Williams and others in a carrier task force – three aircraft carriers and about 20 Navy ships – in the Sea of Japan off Chonjin, North Korea, the weather wasn’t ideal. “It was really a nasty day, heavy winds and snow, a big blizzard and low clouds,” Williams remembers. Around noon, he flew out on patrol with three others: flight leader Lt. Claire Elwood, Lt. j.g. John Middleton and Lt. j.g. Dave Rowlands. Williams was the most experienced of the pilots, charged with protecting the task force by flying a combat air patrol. Earlier that day, he had flown a combat strike against the Hoeryong industrial complex five miles from the North Korea-Soviet Union border. As the four Panthers climbed to 12,000 feet, the Combat Information Center radioed them to warn of inbound bogies: seven Soviet MiGs. Moments later, a warning light signaled a problem with one of Elwood’s fuel pumps. He and Middleton were ordered to hold back at 15,000 feet while Williams and his wingman climbed. As they approached 26,000 feet, they located the MiGs, which were about 50 miles to the north at about 50,000 feet. The MiGs broke into two groups and turned in opposite directions in an attempt to pin the two Panthers. Four of them, still in formation, attacked Williams and his wingman. He pulled up and went after the last MiG within range, scoring a hit. For reasons still unclear, Rowlands followed the plane as it spiraled toward the earth. Now it was six on one. Williams lined up, challenging the MiG and firing until it disappeared under his wings. The remaining MiGs positioned themselves to take on Williams one at a time. At that point, one of the MiGs “scored a 37-mm hit in the right wing stub, penetrating the engine accessories compartment,” according to the official report that had been classified for half a century. Not only was Williams still outnumbered, his plane had been significantly damaged. The cable to the rudder had been severed and the hydraulic system was disabled. It was hard to fly. And Williams was out of ammunition. Williams considered parachuting but knew he would not survive the frigid waters. He aimed to land his plane on Oriskany. As he fought for control, he used gravity and pilot skill to lower the landing gear and tailhook, barreling toward the ship at nearly 200 mph. The plane caught the wire and came to a halt, concluding an unprecedented feat in aviation. Williams’ heroics likely saved the lives of his fellow pilots and prevented an attack on the entire task force. Williams’ experience was highly unusual – the Navy rarely, if ever, practices scenarios of more than four-versus-one. Not only was Williams outnumbered, Riley says, but he was battling superior planes. The MiGs had more thrust, flew faster and “were pretty advanced for their time,” while the Panthers were fairly limited in dogfights. Ultimately, Williams survived because of his “superior airmanship and superior bravery, throwing himself into a battle that was essentially unwinnable,” Riley says. Most dogfights last about five minutes. “It was an eternity,” Williams says of the 35-minute air battle. Waiting for his debriefing, Williams suddenly realized how tired and sweaty he was: “I’d never worked so hard at flying an airplane.” Somehow, he was uninjured except for minor cuts around his neck where the gasket from his flight suit rubbed against his skin. His plane, however, bore the scars. A shipmate used a grease pencil to circle the perforations – all 263 of them. Some were minor while others were up to a foot wide. The plane was in such poor shape that the crew pushed it overboard to its final resting place. While Williams was calming his nerves in the ready room, tensions were escalating aboard the ship and in Washington, D.C. “They’re yelling to our squadron intelligence officer, ‘Get in here – Washington’s on the line ... they want to know now!’” A wrong move could very well have propelled the United States and the Soviet Union into World War III. Washington, crediting Williams with a single kill and one probable damage, while Middleton was linked with a kill and Rowlands a probable. Even though Williams “knew Rowlands never fired a shot,” he was ordered to remain silent and meet with Senior Adm. Robert Briscoe when Oriskany reached Yokosuka, Japan, a week later. Briscoe, commander of Far East naval forces, told Williams he would be credited with at least three kills but that he must never speak of the incident. It wasn’t just the risk of dragging the Soviets into a broader conflict; the United States didn’t want to reveal the existence of the brand-new National Security Agency (NSA). Agents from NSA, which was formed Nov. 4, 1952, were secretly aboard task force member USS Helena. From there, the agents monitored the fight and documented at least three kills by Williams, according to the agency’s report, which was declassified July 15, 2015. When Williams entered the flight in his pilot log book, his commanding officer stood by as he drew one-and-a-half Soviet flags, indicating the “official” number of kills at the time. As the years went by and the real story emerged, Williams modified the entry to reflect four Soviet flags. But Williams never spoke of his secret as he continued his military career, serving in various capacities at home and abroad before eventually hanging up his uniform. Finally, sometime in the 1990s, the Soviets released the names of the four pilots Williams shot down. Williams was then free to reveal his heroic actions, though he remained reticent. Williams figured that since it happened so long ago, few people would care about it. He started by telling Cammie. “Ohhhhh, Royce,” he says, mimicking his late wife’s reaction of adulation and surprise. Royce wasn’t much interested in sharing the story, but Cammie told their family and friends. It was 2002 when Williams finally spoke about it publicly during an event at the Pensacola Naval Museum. How did the only American aviator to single-handedly shoot down four Soviet MiGs keep it a secret for 50 years? As more people hear about Williams’ heroics, support is growing for official recognition – something that should have happened 65 years ago. Nak-yeon and senior military leaders. Former Navy pilot Peter-Rolf Ohnstad was amazed to learn of Williams’ achievement. Ohnstad and Williams are members of American Legion Post 416 in Encinitas, Calif.
“I became a member of Sons of The American Legion when I was 9 years old,” Williams says. Ohnstad, his fellow Legionnaires and others are lobbying for Williams to be awarded the Medal of Honor. At the 99th National Convention in Reno, Nev., the Legion’s National Executive Committee approved Resolution 70, which calls for the Legion to petition Congress and the Department of Defense to so recognize Williams. Years ago, retired Rear Adm. Doniphan B. Shelton – a combat veteran of World War II, Korea and Vietnam – became interested in Williams’ story. He secured endorsements from two four-star admirals, Thomas B. Hayward and Ronald J. Hays, before asking U.S. Rep. Duncan Hunter, R-Calif., to review the case. “There’s nothing wrong with the Silver Star that they gave him, believe me, but it’s not what he earned,” Shelton says, referring to Williams’ 35-minute dogfight nearly 65 years ago. Shelton, who also served as a pilot, says he’s never heard of an air battle similar to that of Williams; neither have naval historians. That’s part of what led Shelton to research the dogfight and push Congress to award Williams the Medal of Honor. In Shelton’s San Diego home, a long table overflows with what looks like a battle plan – maps, sketches and other material related to Williams’ actions. Ohnstad, too, is passionate about setting the record straight for Williams so that future aviators will know what transpired Nov. 18, 1952. Henry Howard is deputy director of The American Legion’s Media and Communications Division. Celebrate 100 years of The American Legion with this Centennial Polo. More products available at Emblem Sales.